Speaker of Parliament Z. Enkhbold recently provided another tweet worth examining in detail. 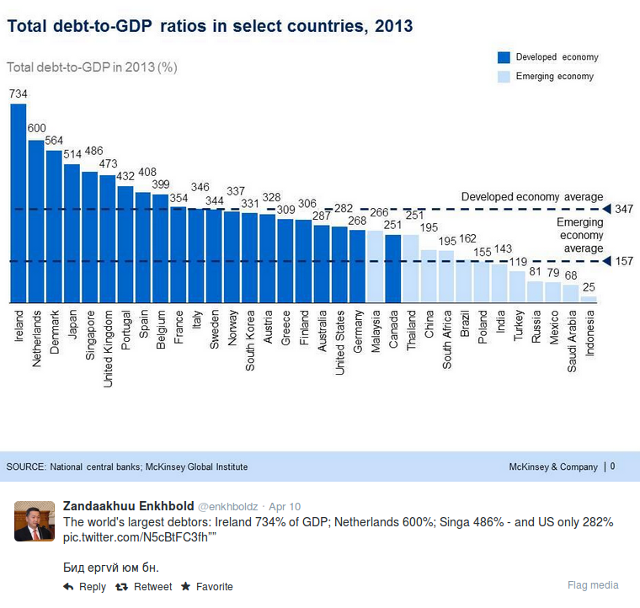 He posted a graph showing “Total debt-to-GDP ratios in select countries.” Mongolia was not one of the select countries in the graph, and the Speaker facetiously noted that “It seems we have no debt.” At least I hope he was being facetious, because the truth is quite the opposite. Total debt is all public and private, foreign and domestic debt that is held by a country and its citizens. In the graph above, it shows the average “developed economy” ratio as 347 percent. For an “emerging economy” like Mongolia, the average is 157 percent of GDP. The graph does not address this, but presumably developed economies on average are able to acquire and sustain much higher debt loads given lower terms of borrowing available in those economies. 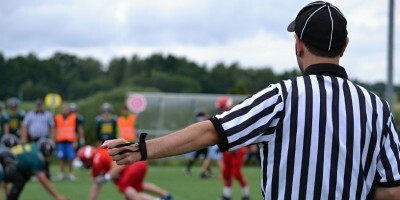 Take a local credit union in Madison, Wisconsin and a local bank in Ulaanbaatar as examples.1 The credit union currently offers a 2.4 annual percentage rate for an auto loan. 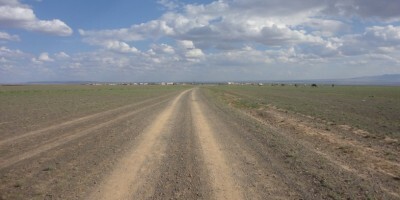 A similar loan from a Mongolian bank costs 14.4 per annum in interest. It’s generally cheaper to borrow in developed economies than emerging economies, but of course that does not necessarily mean high volumes of borrowing are recommended or sustainable. Using data from the Bank of Mongolia and the World Bank, I set out to create a total debt profile for Mongolia to see where it would appear in Speaker Enkhbold’s graph. 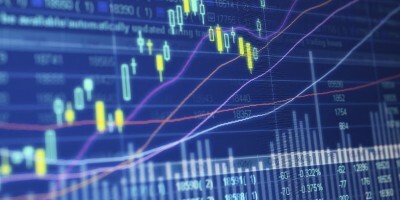 The data available is mostly current values rather than values adjusted for inflation or exchange rate fluctuations. The aim is to see the proportional spread between debt and income each year, so current values should be sufficient to achieve this aim. 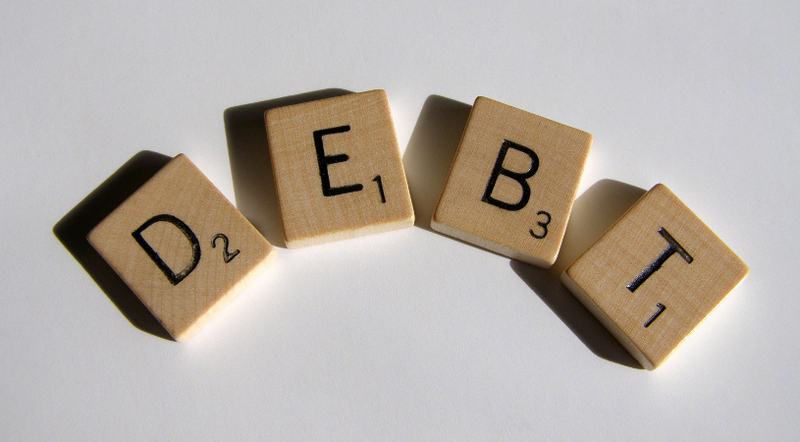 Starting with external public debt (i.e. foreign debt held by the government), the debt-to-GDP ratio is plotted for years 2006 to 2013 in the graph below.2, 3 External public debt spiked above 40 percent of GDP in 2006, 2009, and 2012, and it remained above that level in 2013. The 2009 currency crisis spurred on the adoption of a Fiscal Stability Law which bars the government from exceeding a debt-to-GDP ratio of 40 percent.4 The law was legally enforceable in 2013 for the first time, but included a provision for a maximum ratio of 50 percent that would decease to 40 percent by 2014.5 The government is likely to breach the requirement in 2014 if economic conditions do not improve. 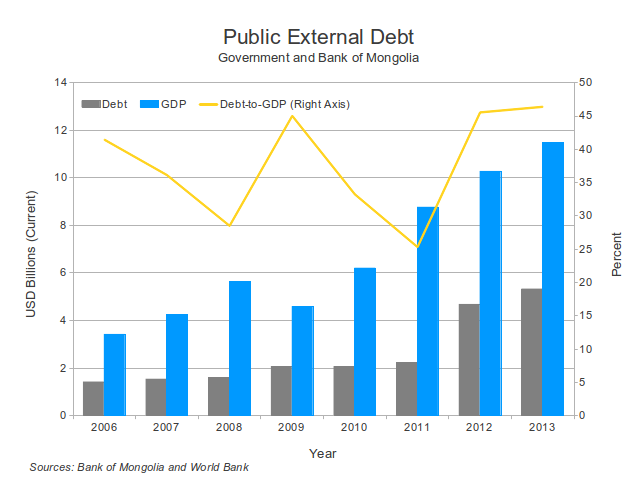 That shows us the public debt the government is carrying, but it is not Mongolia’s total debt. Taking all external debt (public and private) and outstanding domestic loans (e.g. mortgages, car loans, pay day loans; etc) gets us closer to a total debt profile. 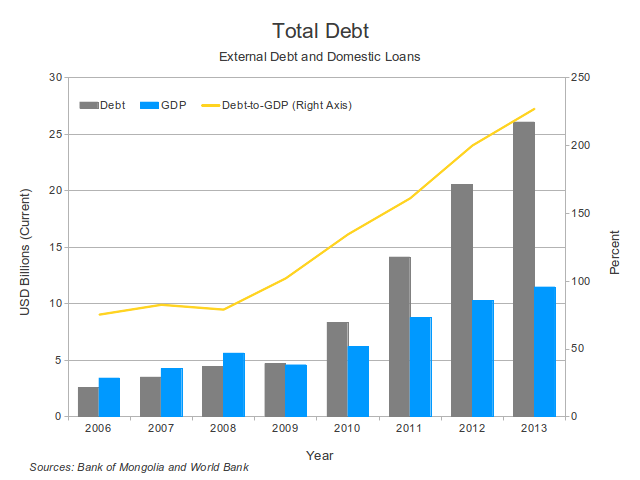 Doing this we see debt in Mongolia has grown faster in the last few years than the country’s income. The graph below shows if you add private external debt and domestic loans to the mix, Mongolia’s debt-to-GDP ratio grew to approximately 227 percent in 2013.6 This puts Mongolia well above the emerging economy average, and it would place it between China (195 percent) and Thailand (251 percent) on the Speaker’s graph. It is important to note there may be other forms of debt not accounted for in the graph below, so there is a potential for the rate to go higher with a more exhaustive data collection. Conversely, the GDP estimate for 2013 was derived by increasing the 2012 estimate by the official real GDP growth rate of 11.7 percent, but the nominal value may be higher, potentially driving the ratio down. The key point, however, is that in spite of these limitations of the data, Mongolia is unambiguously above average for an emerging economy given the mathematical ranges involved. Debt, of course, is not all bad. In fact, if you can borrow money and utilize it to purchase or build income generating assets, you can even claim that debt is quite positive. In Mongolia’s case, it is difficult to know from the data used in this analysis whether the significant increase in public and private debt over the last few years has been good or bad. That subjective point aside, however, an objective test is whether an economy has the capacity to repay the debt. The long-term potential of the Mongolian economy is still quite good if the political and policy environment can consistently improve, so the billion dollar question is whether it also has the oomph to avoid insolvency in the short-term. Whatever the conclusion, Mongolia definitely has debt, and an above average amount of it relative to its income. 1. See advertised rates for UWCU at http://www.uwcu.org/Rates/ConsumerLoan.aspx?rate=228 and for Khan Bank at https://www.khanbank.com/mn/271. 2. All debt and GDP numbers are nominal (i.e. current) figures. 3. Note that the 2013 nominal GDP total was estimated by increasing the 2012 nominal total by 11.7 percent. 4. See section 6.1.4 in the Fiscal Stability Law here: http://mof.gov.mn/wp-content/uploads/2010/12/Law-of-Mongolia-on-Fiscal-Stability.pdf. 5. See section 19.3 in the Fiscal Stability Law here: http://mof.gov.mn/wp-content/uploads/2010/12/Law-of-Mongolia-on-Fiscal-Stability.pdf. 6. Domestic loan balances were converted to dollar totals using the average exchange rate for the given year using historical rates here: http://www.oanda.com/currency/historical-rates.